[via dornob] Concrete has a sometimes-bad reputation as a harsh, rigid, cold-to-the-touch and straight-edged material. 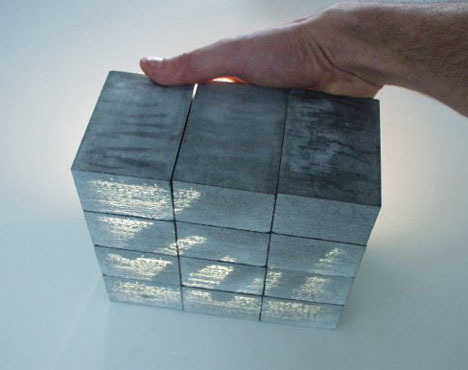 Litracon is doing a great deal to change that image of concrete through a score of creative and sustainable applications for their patented light-transmitting concrete. 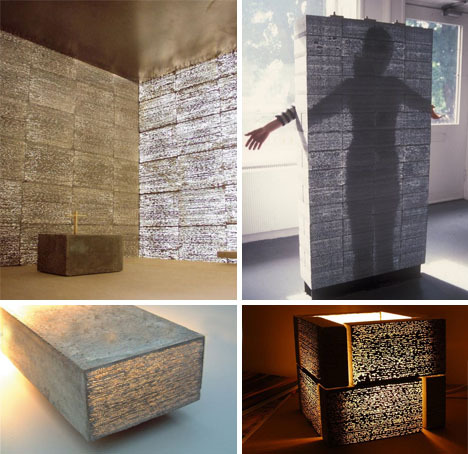 Filled with optical fibers that run from one end of a poured piece of concrete to the other, these prefabricated blocks and panels effectively transmit light from one side to the other. Colors and light remain remarkably consistent from end to end, but with a natural variation from the pouring process that actually softens the effects considerably. The fibers can transmit light to over 50 feet and, as they occupy only a small percentage of the total concrete block or panel, they do not significantly effect the structural capabilities of the poured pieces. 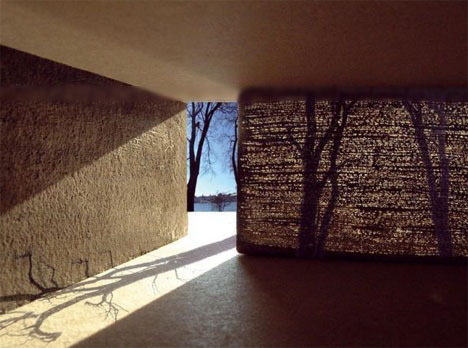 One could imagine all kinds of artistic as well as functional applications for this new-and-improved form of concrete. Daylighting possibilities abound and all with potentially much lower heat loss and cost and with greater durability. Perhaps best of all it puts another broad-ranging, highly versatile material choice in an architect’s or builder’s structural tool kit - what designers do with this solid-but-see-through substance ultimately will probably surprise us all.